Fire Magic grills are Made in the USA and they known are for combining quality craftsmanship with stunning designs. To help you learn all the "ins and outs" of these high performing grills, we've prepared this list of frequently asked questions we often receive about Fire Magic. Watch Chef Tony demonstrate the powerful features of the Fire Magic Echelon gas grill. He breaks down the features and components and performs his grilling tests. Watch the video to learn more about this grill. What's the warranty on Fire Magic Grills? Cast Stainless Steel Burners, Stainless Steel Cooking Grids and Stainless Steel Housings are warranted for as long as the original owner owns them. Cast Brass Burners, Brass Valves, Backburner Assemblies (except Ignition parts) and Manifold Assemblies are warranted for fifteen (15) years. Electric grill's stainless steel cooking grids and stainless steel housings are warranted for ten (10) years. Charcoal Stainless Steel Grills, excluding the Charcoal Pan, Ash Tray and Infrared Burners are warranted for (5) years. Sideburners and all other Fire Magic Grill components (except Ignition and Electronic parts) are warranted for (3) years. *Ignition systems (except batteries), Electronic components (including lights & thermometers), Grill Accessories and the Charcoal Pan and Ash Tray are warranted for one (1) year. What's the most popular Fire Magic series? The Aurora Series offers the same high-end performance as the Echelon along with the quality, durability and cooking versatility at an affordable price. 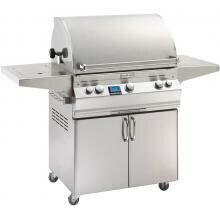 The most popular grill of the Aurora Searies is the A660. To learn much more about the Aurora series, read Chef Tony's Fire Magic Aurora Grill Review. The Echelon Diamond Grill stands for performance, luxury, beauty and innovation. It consists of more standard features along with more upgrades than the Aurora and Legacy combined. Some Echelon grills are know as "A series", and this indicates the grill has an analog thermometer as opposed to digital. The most popular Echelon Diamond series is the E790. If you'd like to learn all the in-depth details of this powerful grill, read Chef Tony's Fire Magic Echelon Grill Review. *Questions? Call us at 1-877-743-2269 Today! Which size Fire Magic Grill do I need? 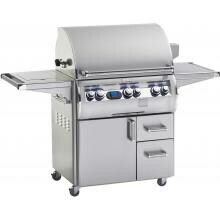 Fire Magic Gas Grills are measured differently than most other gas grills. They measure the size of the grill by the cooking surface of the grill, and not end to end grill. Other brands that may be considered a 36" grill will actually be smaller than a Fire Magic 36" Grill. Listed below are the cooking area sizes for each style. Each "style" listed below is a code. "E" stands for Echelon and the "A" stands for Aurora, and the number following is the square inches of cooking area of the grill. Do I need the Fire Magic Sear Zone? Fire Magic sear zone is considered the infrared burner on the outside. It was created because sometimes an infrared burner can take up much needed space inside your grill. Now, you have the option of adding an infrared burner on the outside of your grill. This allows you to use the main cooking area for conventional cooking and the searing station at the same time! Which burner configuration should I choose? Your choices will come down to either all cast stainless steel burners or one infrared burner with the rest cast stainless steel. Which one will I benefit from? Cast Stainless Steel - (Most Popular) All cast stainless steel burners allows you to cook a variety of foods. The advantage of all cast stainless steel burners are they will never rust and can't be damaged by grease or cooking utensils. Infrared/Cast Stainless Steel - This option (also known as hybrid) allows for a more versatile style of cooking such as cooking conventionally and cooking on an infrared at the same time. The advantages of cooking on an infrared is it reduces prep time, creates a better sear, locks in juices and flavor, will not dry out your food, and much more. Does Fire Magic have any outdoor kitchen accessories? Whether you're building an outdoor kitchen or buying a stand alone grill, we have the Fire Magic grilling accessory you need. We carry the full line of Fire Magic Outdoor Kitchen Accessories including access doors and drawers, side burners, beer dispensers, grilling tools and more.